Pet rental is the practice, usually administered by for-profit companies, of renting pets such as dogs and cats. Rental also includes animals who are hired out at a specific rate for a specific time. It is a controversial practice opposed by many animal rights advocates and has been banned in at least one municipality: Boston, Massachusetts. There are several methods of renting a therapy dog as a part of the Mayo Clinic's Caring Canines program The dogs that participate in this method of pet renting make regular visits to various hospital departments and can make special visits upon request. The dogs that participate in this program have been welcomed by the patients and are considered a good distraction from the atmosphere of the hospital. Another method of pet rental includes renting animals for an event. Animal Craze, a traveling farm, specializes in renting animals for birthday parties or other events. These services usually range from $200 to $500 depending on the number of animals and the kind of animals a person chooses to rent. Mobile Zoos are also a form of pet renting for events. Mobile Zoos are popular in the United Kingdom and provide exotic animals for children's parties. Another form of pet renting includes puppy parties. Puppy parties usually include 5-10 puppies that are placed in a playpen for people to come and either cuddle, handle, or play with. If the people at the party are younger in age, they are instructed on how to properly handle the puppies. The puppies at these parties are usually between 2-6 months old. Companies such as Puppy Parties add a cute and therapeutic aspect to school, corporate, and private events. Their puppies have also been seen on the ABC show Good Morning America. Not being able to have animals in their house due to rental agreements. Not being able to have animals in the house due to allergies. Not being able to properly take care of an animal due to excessive traveling or work. Not being able to currently afford an animal or supplies necessary for caring for a pet. The first known cat café was located in Taipei, Taiwan, named Cat Flower Garden. Opening in 1998, it became a place for stressed out visitors to come drink coffee and pet cats. Cat cafés increased in popularity in Japan because most renters were not allowed to own pets. In 2005, Shop of Cats in Tokyo became a place for single income families to enjoy the comfort of the pets that they couldn’t own. In April 2014, New York took on the cat café idea, which took off immediately. Sponsored by Purina One, it lets families meet adoptable cats. Additionally, two pop-up cat cafés in California, located in Bay area and Oakland, opened in 2014. The San Francisco location, KitTea, was open to both rescued and feral cats.The Oakland location, Cat Town, was designated to cats that were ready to be placed in a home. In Europe, cat cafés took off in places like Paris, Berlin, and London. Dog Cafés are popular in Korea and the United States. One café in Santa Monica, named Grounds and Hounds, sponsors shelter dogs that are up for adoption. Customers can pet these puppies in a designated area of the café. In Korea, dogs in the café are from puppy mills and are not up for adoption. This practice, however, is changing quickly. Dogs in cafés like Grounds and Hounds are adoptable shelter dogs, some suffering from physical illnesses. In these cafés, strict health codes are enforced, requiring animals and food to be separated. For the animals to stay overnight, the café was built in an industrial zone - which is a requirement given by the L.A. Health Department. In Tokyo, there are pet cafés with rabbits, birds, goldfish, reptiles, goats, and penguins. These cafés are the most popular for those with strict renting policies in Japan and for tourists. To protect the well-being of the animals, some cafés have specific time limits. Other rules include that food must be separate from the animals, or there must be trained handler on hand. With some animals, specifically penguins and reptiles, visitors are there to watch, but not to touch the animals. In some cases, visitors may pay extra for pictures with the animals. One method of pet renting is animal assisted therapy. Animal assisted therapy can help to reduce pain, anxiety, depression and fatigue in people with a range of health issues including: children having dental procedures, people receiving cancer treatment, people in long-term care facilities, people hospitalized with chronic heart failure and veterans with Post Traumatic Stress Disorder PTSD. Other benefits from programs that use pet renting include not only the people who are sick, but it also includes the loved ones of the ill patients too. Patient's family can also receive benefits due to the happiness that an animal can bring to their loved ones. In the United Kingdom, the use of Mobile Zoos has become a cause for concern. Because of this, Mobile Zoos will soon require licenses to operate in England. The RSPCA recently announced that the Mobile Zoos' were handling the meerkats and raccoons inappropriately. Under the changes to the Animal Welfare Act 2006, anyone who wishes to own a business that provides an animal for an exhibit must require a license from the local authority, including Mobile Zoos. The exhibits must also adhere to welfare standards developed with those working in the sector and animal welfare charities. Some of the biggest concerns that hospitals face is the safety and sanitation that comes with the therapy dogs that visit. Most hospitals with dog therapy programs have a strict policy to ensure that animals are clean, vaccinated, well trained and screened for appropriate behavior. Across the United States, there are over 40 animal talent agencies. Every day, agents audition talented animals for parts in film, theater, photo shoots, and television commercials. Each animal talent agency represents hundreds of clients which include animals in wildlife preserves, pets, and even domestic and exotic species. Though the need for animal actors is declining due to modern digital animation, for commercials, the typical rate in New York is $800 a day for a dog. In the movie Snakes on a Plane, reptile wrangler Jules Sylvester had brought over 27 types of snakes on the movie set. Snakes get tired after an hour of work, and can become over stressed, causing a snake not to eat for a week. It is for this reason that particular snakes are leased for an hour at a time. Due to animal killing scenes in movies such as Call of the Wild (1937) the American Animal Defense League (AADL) started taking measures to protect hired animal actors from abuse. Investigations involved popular Hollywood studios such as Warner Brothers and 20th Century Fox regarding abuse in films as well as abusive living conditions. More recently, the American Humane Association's (AHA) Film and Television Unit have taken the initiative to make sure animal actors were not harmed in the making of the movie. The AHA began monitoring the safety of animals after Jesse James provoked an outcry when a horse was forced to leap to its death from the top of a cliff in 1939. The AHA prides itself on ensuring safety for all animal actors. 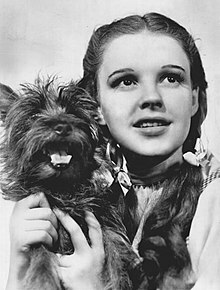 The animals people gaze upon on the internet, in advertisements, are prized for their “cuteness.” This was seen in the 1939 film The Wizard of Oz, as Toto or “Terry the Terrier” made over $125 a week, compared to the Munchkins, who made $50. ^ "Definition of RENT". www.merriam-webster.com. ^ Wills, Santiago. "The Crowded, Competitive World of Animal Acting". The Atlantic. ^ "I WAS THE ONE WHO PUT THOSE... SNAKES ON A PLANE". People. 66 (9): 77. ^ Malamud, Randy (2007). "ANIMALS ON FILM: THE ETHICS OF THE HUMAN GAZE": 1-26. ^ Kuhler. "Highest Paid Animal Actors That Are Paid More Than Most Human Actors". Retrieved 17 March 2018. This page was last edited on 6 March 2019, at 00:52 (UTC).